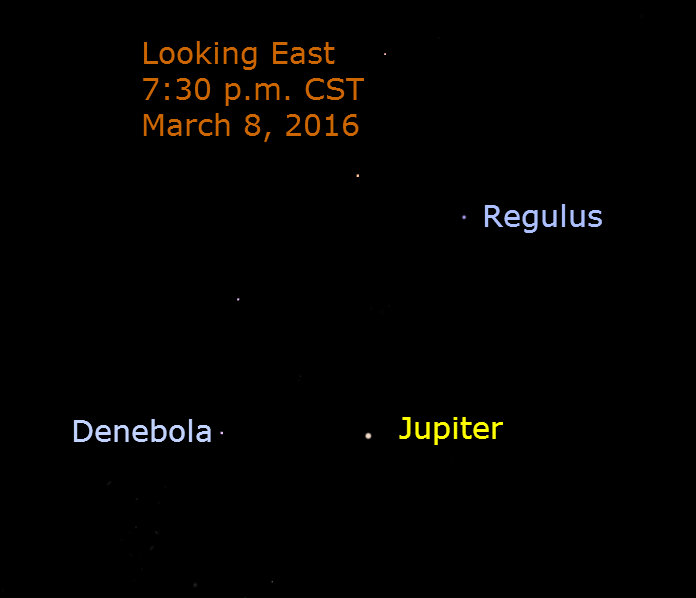 Jupiter is at opposition today (March 8). It rises in the east at sunset; appears in the south at midnight; and shines from the west at sunrise. Today our planet is between Jupiter and the sun, so they are on opposite sides of our planet and appear in opposite positions in the sky — opposition. Jupiter is closest (409 million miles) to us and at its brightest. It shines in front of the stars of Leo with its brightest stars Regulus and Denebola. Jupiter takes nearly 12 years to revolve around the sun once. In this Jovian year, Jupiter slowly creeps eastward among the stars, taking the entire Jupiter year to travel along the ecliptic. Tonight Jupiter appears nearly 90 degrees from Saturn, which completes one solar orbit every 29.5 years. Jupiter is slowly catching Saturn which rises about 12:30 a.m.
On December 21, 2020, Jupiter passes Saturn in a spectacular conjunction. The planets appear about 0.1 degree apart! 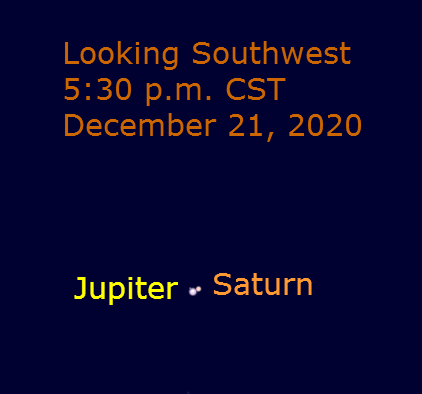 The following Great Conjunction of Jupiter and Saturn is Nov 5, 2040. The planets are separated by nearly 1.5 degrees on this conjunction. So keep track of the two planets and watch Jupiter slowly catch Saturn.